Please do not think that I am suggesting that you need to go on a diet. Even if you did need to go on a diet, I probably would not tell you for fear of hurting your feelings…. This is simply the name of a book that I highly recommend. 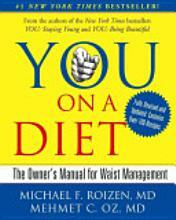 YOU On A Diet is part of the YOU series written by Dr. Oz and Dr. Roizen. I am a big fan of Dr. Oz. He was actually the one who inspired my Quinoa With Black Beans recipe. I quote him all the time, “Dr. Oz says this and Dr. Oz says that.” My husband is sick of hearing what Dr. Oz says. I started watching his segments on Oprah and now record his show daily. He is a wealth of knowledge when it comes to anything health related. You On A Diet was the first book that I purchased by Dr. Oz and Dr. Roizen years ago. Then there is YOU Staying Young, YOU Being Beautiful, YOU Raising Your Child, etc. I liked the first book so much that I purchased them all. The reason I love this series is that it gives you a lot of really technical and medical information in terms that any person could understand. As an added bonus they are witty and sometimes even laugh out loud funny (seriously)! Even if you do not need to loose a single pound this book is a terrific resource to learn how your body processes and stores food and fat. It also has some really good and healthy recipes and a work out plan that anyone can benefit from. I started reading YOU On A Diet when, well, I needed to go on a diet. I was expecting a recipe for weight loss and found that this book is so much more than that. You gain insight into how your organs and hormones handle the food that is put into your body. Being armed with this knowledge makes it much easier to buy into the doctors’ suggestions for changing your eating habits. Even though they cite cutting edge medical research and biological facts it is always done in a way that anyone can understand. I have pretty limited medical knowledge and never felt that the book was difficult to understand or over my head at any point. I purchased the book to find a healthy plan to loose weight. YOU On A Diet really does give you a step by step plan for weight loss and weight management. Again, even if you do not need to loose any weight it provides a plan for healthy eating that anyone can benefit from. The YOU plan is so detailed that it offers a day by day and meal by meal menu planner, a shopping list, recipes and work out regimen. I followed the plan. Yes, I lost weight, no it was not hard, and no I did not feel hungry. That is the ideal with any diet in my book! Even though I read this years ago I still utilize the knowledge I gained from the book all the time to this day. One of my favorite parts is the recipes. The Asian Salmon is my favorite and I still make it often. I get rave reviews from anyone I make it for and it is very easy. I also really like a lot of the soup recipes, my favorite being the gazpacho. This book was so popular that it was re-released recently. It is a really quick and easy read and is such a wealth of information. I highly recommend it! I love to read. I love food. So, every once in a while I read a book about food. Not just a cookbook (although I do read those like books too), but an actual book about food. Now I know you are thinking that there is no way a food book is going to hold your attention or be a good read. I thought so too, but I was wrong. A few years ago my good friend Cathlin and I were talking about reading material as we have very similar taste in books. 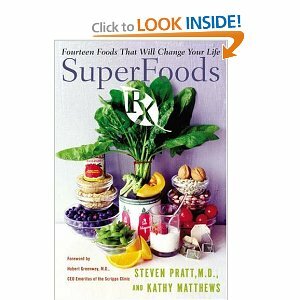 Since she knows that I have an interest in good and healthy food and recipes she suggested that I read Superfoods Rx by Dr. Steven Pratt and Dr. Kathy Mathews. Based on her suggestion I purchased the book. I immediately flipped though it and did not see any pretty pictures of beautiful recipe creations and was skeptical. Luckily I gave it a chance and am so happy that I did! The premise of the book is that eating certain foods can actually improve your health and increase your longevity. The authors calls these foods SuperFoods. I loved this premise as we are so often told of the foods we should not be eating. It was refreshing to hear about the foods we should be eating. I also like that they specifically state that anyone at any age can benefit from eating these SuperFoods. Even if you have never made these foods part of your diet, you can still benefit by adding them at any point in your life. In the book Dr. Pratt cites personal examples where he has seen food dramatically improve quality of life and decrease disease. He also cites loads of research demonstrating that by making these foods part of your diet, you can actually change the course of your biochemistry, can prevent all kinds of diseases and can even improve longevity. He talks about micronutrients, phytonutrients, flavonoids, antioxidants and more. The best part is that he explains all of this in layman’s terms. It is not overly scientific, but he does give evidence to back up his points. In addition to going into detail on each of his fourteen SuperFoods and their health benefits, he also gives substitutes in case you do not like a particular SuperFood. For example, if you do not like tomatoes he suggests other lycopene rich foods such as watermelon or red grapefruit. If you do not like spinach he suggests other leafy greens. Another nice feature is that there are recipes featuring SuperFoods from acclaimed Chef Michel Stroot of the Golden Door Spa. Some of them are easy enough for even a novice cook to follow and are delicious! In addition the book provides shopping lists and supplement recommendations.